The Russian ruble is gloomy on oil prices, after both the US and EU oil benchmarks dipped below $50 per barrel, dropping to 64 per USD$1 in Wednesday trading. The Moscow Exchange is closed on Wednesday as the country observes Orthodox Christmas. 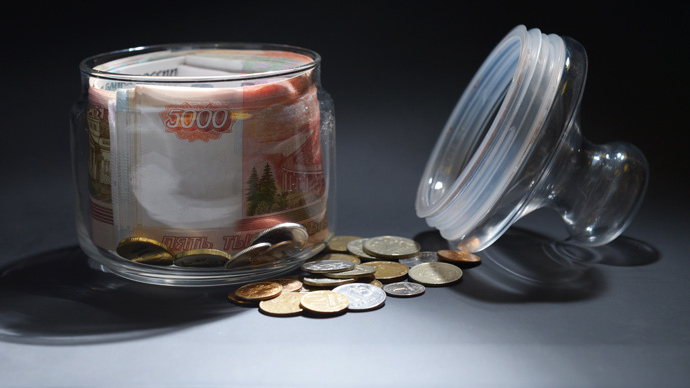 On Tuesday, the ruble lost 5 percent to the dollar. The Russian ruble has lost value with sliding oil prices, which lost more than 50 percent in 2014, plus an additional 10 percent since the beginning of 2015. A major ruble wipeout occurred between December 15-16, when the Russian currency lost more than 20 percent of its value in just one day. On the December 16, 1 US dollar cost 79 rubles, with 1 euro going for nearly 100. Brent crude dropped below $50 per barrel on Wednesday after WTI slid to the same mark for the first time since the 2008-2009 financial crisis, when prices dropped below $40 per barrel. As an oil exporter, Russia’s ruble is highly sensitive to oil price movements, as the black commodity is the country’s main export. Already, Russian ministers have cut their 2015 oil forecast to $80 per barrel from $100 a barrel. However, a weakening currency isn’t all bad for the Russian economy, as they sell oil mainly in dollars, which balance out the declining domestic currency. Volatile ruble movements are also attributed to the geopolitical standoff with the West over Ukraine, which has resulted in financial sanctions against Moscow. Many state companies are now blocked from long-term loans, which could slow business activity, creating worry among investors in Russia’s economy. Soaring ruble rates have pushed up inflation, too. Consumer prices in December reached 11.4 percent, more than double the Central Bank’s original target.